64 mini pads for triggering clips, playing drum racks, controlling your mixer and doing just about anything else in Live, all while making amazing performance videos for YouTube. Get hands-on control of anything in Ableton Live without any set up. 64 multi-coloured mini pads for launching clips, playing drum racks, triggering effects and loads more. This model is the smallest and lightest Launchpad, perfect for the compact setup. Create awesome multi-coloured Launchpad lightshow videos. Start and stop loops, arm tracks, and control volumes, pans and sends all using the grid. Control FL Studio while you play on the piano roll, trigger samples and effects, and much more – it’s a brand new way to play FL Studio. With the Launchpad Mini you can just plug in and play, as its USB bus powered and totally class-compliant, so it works straight away without any drivers. Create a full studio by combining Launchpads or add other Launch products to control all of Ableton Live at once. You can simply make music immediately, as this pack includes Ableton Live Lite, Novation Bass Station and V Station virtual instruments and over 4GB of Loopmasters samples. You can also rely on Novations two-year warranty if any hardware needs repairing or replacing due to a manufacturing fault. Practice rhythm using Melodics to hone your pad drumming skills for free. Also Included is Launchpad Arcade, a place where you can get straight into making music with Launchpad's familiar clip-based user interface. Control Ableton Live - Get hands-on control of anything in Ableton Live without any set up. Get creative - 64 multicoloured mini pads for launching clips, playing drum racks, triggering effects and loads more. Size matters - Smallest and lightest Launchpad, perfect for the compact setup. Make something spectacular - Create awesome multicoloured Launchpad lightshow videos. Mix with your grid - Start and stop loops, arm tracks, and control volumes, pans and sends. Control FL Studio - Play on the Piano roll, trigger samples and effects, and much more – it’s a brand new way to play FL Studio. Plug in and play - USB bus powered and totally class-compliant, so it works straight away without any drivers. Enjoy two years of warranty - Rely on our two-year warranty if any Novation hardware needs repairing or replacing due to a manufacturing fault. Practice rhythm - Use Melodics to hone your pad drumming skills for free. 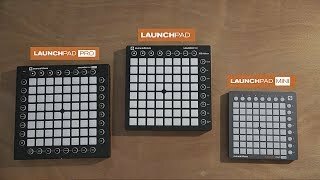 Get started with Launchpad in seconds - Launchpad Arcade is a place where you can get straight into making music with Launchpad's familiar clip-based user interface. System requirements - Launchpad Mini is class compliant, so will work with any modern Mac, Windows or Linux PC. For further information see the Novation web site.